When you first start matched betting, it can often seem daunting as to how much cash you need in your exchange to take part in every offer, but by choosing different winners for the same event you can significantly reduce your liability required. Let’s say you have two £10 trigger bets (min odds 2.0) you need to place and you decide to bet on the Burnley v Bournemouth match. You place one £10 lay bet on Burnley at lay odds of 3.2 for a £22 liability and another £10 lay bet on Bournemouth at 2.6 for a £16 liability. Adding up these liabilities gives you £38 total liability. However, only one team can win this match and your exchange knows this! So, the exchange only needs your highest liability, being £22 on Burnley, rather than the full £38 liability. Plus, if you lost the £22 liability on Burnley, then you would win your £10 lay stake on Bournemouth. So overall, the exchange only needs £12 total liability! Please note, it is not recommended to place opposite bets with the same bookie on the same match. In the example above, you placed your back bet on Burnley with Bet365 and your back bet on Bournemouth with Paddy Power. Let’s say you three £10 free bets to use up and you're looking for some high odds horses. The £10 free bets on the 8.0 horses would each have a liability of around £60 whilst the 12.5 horse would need around £105 liability. This gives a total liability of £225. As in the first example, your exchange knows only one horse can win the race! So, the exchange only needs your highest liability, being £105 on the Fast As Jaguars rather than the full £225 liability. Even better, should Fast As Jaguars win then you would win your £8 lay bet on Rams Rider and New Horsey – again, the exchanges know this! (for simplicity, let's assume you have placed a £8 lay stake for each of your free bets). So, placing these three lay bets, the exchange only need £89 liability, being £105 liability (Fast As Jaguars) - £8 lay stake (New Horsey) - £8 lay stake (Rams Rider). This has freed up £136 of your bankroll to use elsewhere! It’s best to place your lowest liability first! This is because by the time you go to place your highest liability lay bet, it will then instantly net off against the lay stakes of your other lay bets. The exchange will deduct £60 liability from your account. Your exchange will will increase by £8 to your balance as your combined liability is now only £52. This is because your highest liability is still the same at £60. However, this £60 liability on the New Horsey is now netted off against your £8 lay stake on the Rams Rider for a £52 combined liability. The exchange will deduct an additional £37 liability from your account, for now a total £89 liability. This is because your highest liability has increased by £45 (going from £60 to £105 on Fast As Jaguars). However, you have now placed an additional lay stake on another different horse, so your combined liability only increased by £37 (£45 - £8). Had you placed your lay bet on Fast As Jaguars first, then you would have needed a £105 liability initially. 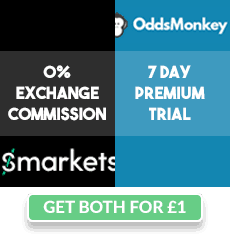 Whereas by placing other two lay bets that have the lower liability, the highest amount you have needed in your exchange at any one moment is £89. Hope this guide helps and any questions please do ask in the Facebook Group cheers!